"I’m glad I went to Derby College and gained on the job training at the same time as studying for my foundation degree." Finding a Derby College course that combined his love of maths and building set former Higher Education student Craig Shore on his way to becoming a quantity surveyor. Craig, who took the college’s foundation degree in Construction and the Built Environment, especially liked that he could study part-time while also gaining practical, on the job experience at work. 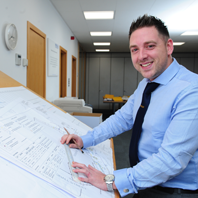 Now aged 31, Craig initially worked as an estimator with Bowmer & Kirkland before progressing to QS roles with other Derbyshire firms and also studying for a BSc (Hons) degree. He graduated from the University of Derby in 2010 with a 2:1 in Construction Management. Originally from Wirksworth, Craig now works for Whitehouse Construction in Ashbourne as a QS and enjoys the variety his career offers. He likes getting to divide his time between site and office, and the diversity of interesting civil engineering and construction projects his career offers. He and his team are currently involved in a scheme to create new access roads and a car park for the Forestry Commission in Nottingham. Craig, who is married with two young children, would ultimately like to become a commercial director but is happy to have attained his goals to become a QS.